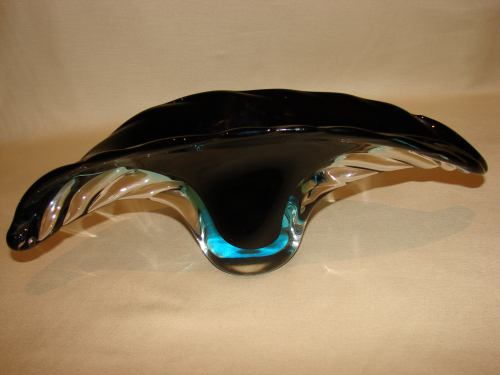 Curved shell-shaped bowl/centrepiece by renowned Murano designer Alfredo Barbini. The shell is made of colourless glass. The base is interlayered with bright turquoise blue and the top in deep lilac. Hard to capture in a photograph but stunning in the flesh. Alfredo Barbini is recognised as one of the leading Murano glassmakers of the last century and his pieces can be found in museums the world over.